Home » Customer Questions » Are there different types of pan drawers? Are there different types of pan drawers? The simple answer to that question is yes! We have 3 distinct pan drawer variants. Pan drawers are very valuable and a much utilised kitchen unit in anybody’s kitchen, which many of us could not live without. It’s a very convenient place to ‘chuck’ pans in until the next time they are required. If you have standard pan drawers then you tend to find that the pan handles can protrude through the drawer sides and scrap against the side of the unit when you close it. 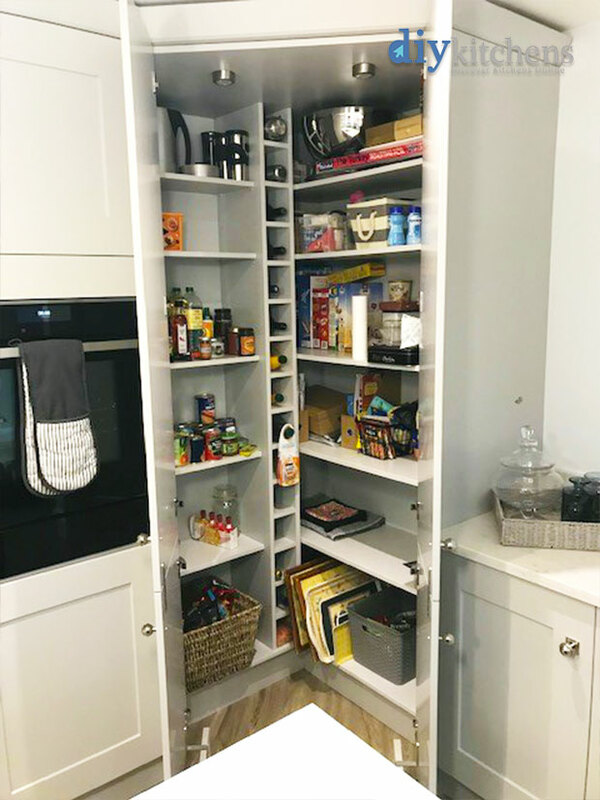 But, there is a simple solution available by having your pan drawers fitted with higher sides, as shown in the videos below. All our drawers are fitted as standard with Gallery Rail sides. This video shows the high sided pan drawers that you can upgrade your pan drawers to. If you want to upgrade even further then you can have glass sided pan drawers for the ultimate effect, especially pleasing on the eye when you have in-unit lighting. If you want to upgrade your pan drawers in your shopping cart then you will need to click the “Special upgrade offer” button at the bottom of your shopping cart to do so. 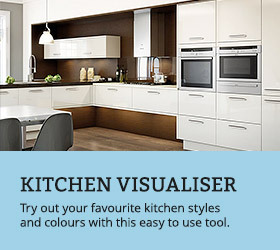 You can see all the pan drawer kitchen units that we have available on our pan drawer page. If you are opting to buy a pan drawer unit with an internal cutlery tray and a hob above it then we do recommend that you have “at least” a 30mm depth worktop (preferably 40mm) and a hob which is no more than 50mm in depth. This is to ensure that the tray can close without any obstructions from the hob above it. So, if you have a worktop which is 30mm in depth plus 18mm for the top of the unit and 8mm between the top of the tray and the unit then you would have a clearance of 56mm, giving you an actual 6mm gap between the top of the drawer and any elements on the underside of the hob. A worktop of 40mm in depth would give you a safety gap of 16mm. 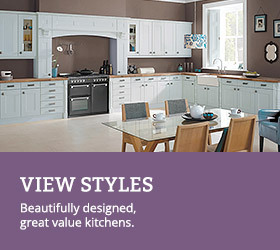 What colour matched cabinets do you have available? I am ordering a highline double pan drawer 1000mm wide and will have a downdraft induction hob sitting above. I need to modify the drawers on site to make them shorter (around 400mm). I have requested for it to be supplied dry assembled. Is the back panel of the drawer easily removed so that I can reposition to the required size? The hob is only 800mm wide so I should have 100mm either side to allow for the runners to remain full depth, so I am planning to move the back panel forwards and cut out the back part of the drawer base to house the ducting. Can you also advise what material the base of the drawer is made from? Thank you. Hi Richard, unfortunately it will not be possible to cut down the back of the drawer box onsite, as these are metal with a solid MDF base. As I have requested that it comes dry assembled I presume I can dismantle the drawer on site? If the metal frame of the drawer can be taken apart I can probably modify it to fit around the ducting. Hi Richard, I would recommend contacting the technical sales team 01977 608 418 or create a support ticket below for further assistance on this question. Can you please tell me the maximum weight that you can put inside the 50cm wide pan drawers and the 100cm wide pan drawers? Hi Kate, all our pan drawers come with Blum runners, capable of carrying a maximum of 50kg in weight. I have a hob that has an integrated downdraft which drops down 210 from the top of the unit. I would like an inframe kitchen so cannot get the drawers with the cutout. If I bought the pan drawers with a celery drawer at the top, would the top drawer be deep enough to just block this drawer off and not use it? Alternatively I could just get a 2 pan drawer and mark out the space in the middle. How high is the back of the drawer and would that clear the 210 when opened? Hi Jonathan, on the 2 pan drawer plus one cutlery drawer unit, you will have an approximately 76mm gap between the top of the unit and the top of the cutlery drawer box. On the 2 pan drawer unit, you will have a gap of approximately 84.5mm between the top of the unit and the top of the drawer box. 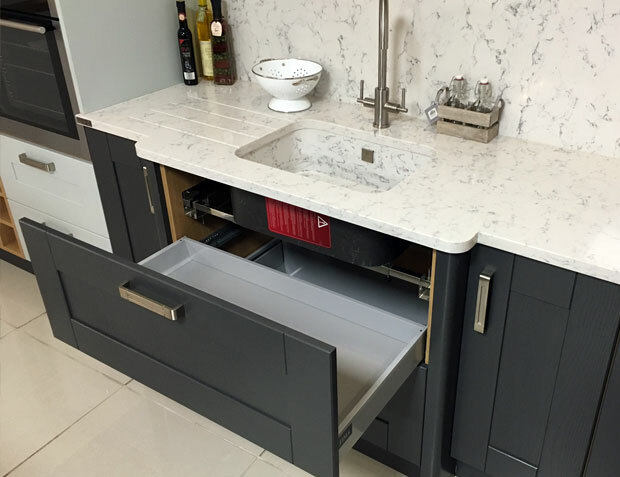 It would usually not be possible to fit a down draft extractor in a drawer unit, so we would recommend using a high line unit instead. Or, use an over sized worktop and place it behind the units. Thanks, would it work though if I removed the top drawer (of the 3 pan drawer) and just left the drawer front screwed in place and then just used be bottom two drawers? I.e, what is the drop from the top of the unit to the bottom of the first drawer. I’m keen to have pan drawers under my cooker so they are easily accessible. Hi Jonathan, from the top of a 3 drawer unit to the bottom of the first pull out pan drawer is 380mm. If your downdraft extractor is only 210mm deep then in theory, the extractor has enough space below it, to slide into. But, you would not be able to use the cutlery drawer or the top pan drawer for storage. What is the drawer unit shown in this picture as it appears that this would work for what I want? 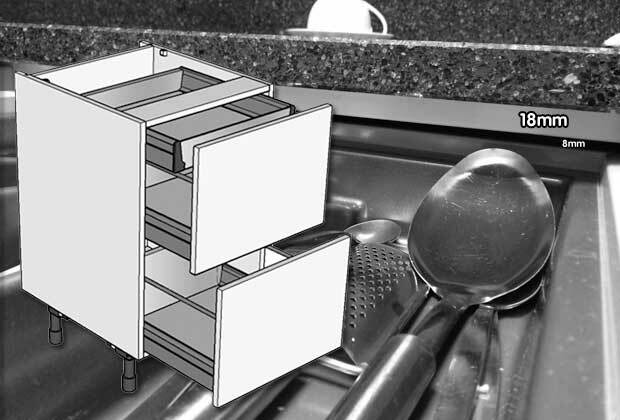 Hi Jonathan, this is a 2 drawer pan drawer – https://www.diy-kitchens.com/kitchen-units/base/pan-drawer/2-drawer-pan-drawer/ – The height of the unit is 720mm, so the height from the top of the unit to the base of the top pull out drawer would be around 320mm, deep enough for your 210mm downdraft extractor to slot into. For your reduced depth drawerline base cabinets (300mm & 460mm), what are the internal depth/length of the drawers? Hi Adrian, the length of the 300mm depth unit drawer is 250mm. The 460mm depth unit drawer is 300mm long. The depth on both drawers is 90mm. What about the clearance of a pan drawer unit with a cutlery drawer (not internal), such as P2D1 or P2D2? What is the maximum depth of a hob that could be installed with these and a 20mm worktop? Hi Johanna, the maximum height the hob can be when using the three pan drawer units and a 20mm thick worktop would be 45mm in height. Does this mean that with a 45mm hob on a 27mm worktop, I would still be able to have a functional cutlery drawer underneath (in 80cm 2 pan drawer, 1 cutlery drawer unit) ? I was assuming it would have to be a false drawer. Our hob is induction. Hi Francesca, that would be fine, this means the hob only protrudes by 18mm, if it protrudes more than 28mm then that’s when the drawer will not work. Are the drawers always metal/plastic construction or is there any upgrade options to wood veneer? 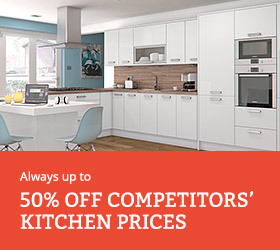 Hi, Sana, we can upgrade for £35 per drawer, top drawer only not pan. If you can send over your cart number in a support ticket below, then the sales team can make the change for you. 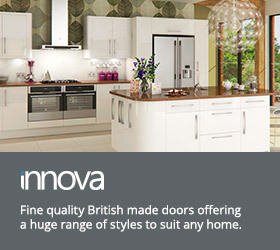 Hi, Can you get a 600 fully integrated dishwasher door to match the lines of a 2 drawer pan unit ? Hi, no this is not possible. Only the drawerline effect can be achieved with an integrated appliance door. Hi I have a 800 2 draw with cutlery tray in top draw, how do you remove the pan draws if needed. Hi, to remove the drawers, you need to pull them out to full extension and lift upwards with a fair amount of force and the drawer box will come off the runners and you can then pull it out. Is that the same method if they have soft close? Can i use a 20mm deep quartz worktop with a gas hob? Planning to have drawers underneath it but not cutlery drawer. Thanks. Hi, providing there is no cutlery drawer, the hob will be fine recessed into 20mm worktops. Hello, please can you tell me the weight capacity of an 80cm wide pan drawer. Thank you. The 800 wide pan drawers come with Blum runners capable of carrying 50kg maximum weight. For clean lines, can I have false line drawer doors in base units, that are not actually drawers but cupboards, appliances and pullouts etc? 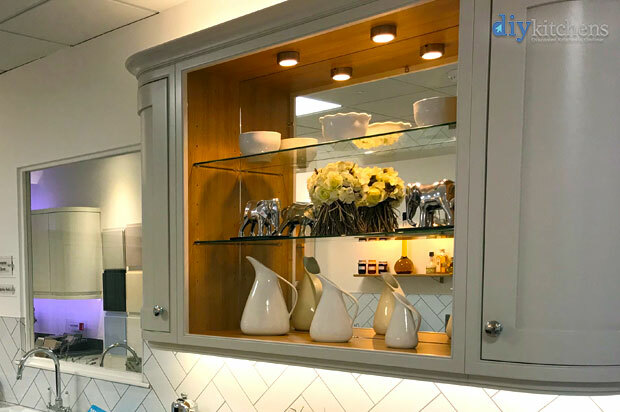 We don’t fit “drawerline effect” doors to our units but it is fine to have a drawerline effect appliance door to match the drawerline in your kitchen, we do sell these online. How far do your pan drawers extend when fully pulled out? Thanks, that’s helpful. I did call your sales office several times and when I spoke to someone the response was different from above. Appreciate the clarification. Hi, what is the clearance at the top the 900mm pan drawer with hidden insert cutlery drawer? Wanting to put a hob above it but hoping to have 20mm depth quartz worktop and struggling to find a hob with less than 50mm depth. You can use this pan drawer unit with a hob above it but the work surface needs to be at least 40mm in depth to give you the clearance needed. The clearance between the internal pan drawer and the bottom of the worktop would be 26m, as show in the image above & below. 18mm is the thickness of the top of the kitchen unit and 8mm is the gap between the top of the internal drawer and the top of the kitchen unit. If you have a worktop that is 30mm in depth then the total clearance would be 56mm. Should you need to contact us about your order at any point in the future then our contact details are below.